Not only am I a rabid Apple fan, but I also love movies. There's seriously no better place in the US of A to watch a movie than at an Alamo Drafthouse theatre, where you can eat, drink adult beverages, watch your movie in digital awesomeness, and even have people thrown out of the theater for life if they talk or text. But the best thing about Alamo is what they do before the movies are actually shown. Instead of bad previews or ads, you get an eclectic mix of video clips, old movies and weirdness that usually has something to do with the movie you're about to see. 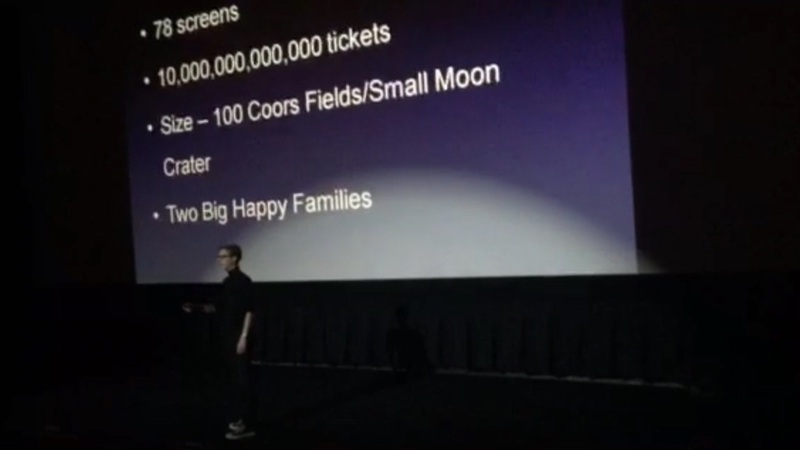 So what did the Alamo Drafthouse Cinema in Littleton, CO (just an iPod's throw away from the Apple Store Aspen Grove) do for the premiere of "Steve Jobs" on Thursday? Easy - they had "Steve" give a keynote.